If you live in the city, color coming from you kitchen tap is most likely the result of pipes. Copper pipes might lend a bluish or greenish color, and red water almost always comes from aging iron pipes. The water may be cloudy for a time, and this usually means there is air in the city’s water line. The test is to run it into a glass and watch it as it clears; if it clears from the bottom upward, it is air. Brownish and rusty colored water can also result from city activities like repair of water lines and flushing of fire hydrants. The cure for these is rinsing until the water runs clear. 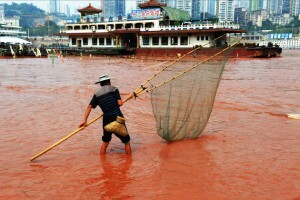 The Yangtze river, September 6, 2012, in Chongqing, China. 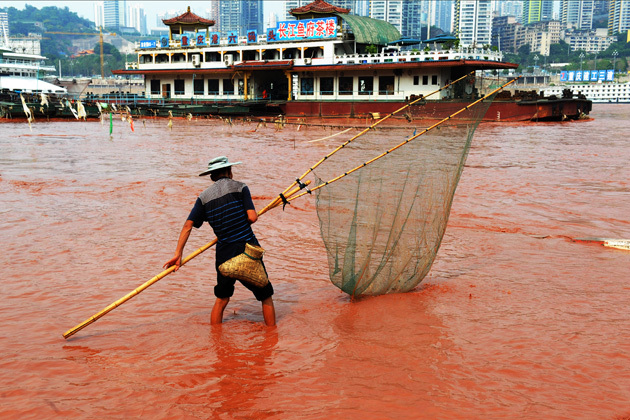 The Yangtze is usually brown to orange because of silt runoff from deforestation, but the new red color leads to suspicion that serious industrial pollutants are entering the river. Yellow. Often referred to as “tannins,” indicates that humic acids are present. Water with an tannins often appears tea colored. Reddish water indicates precipitated iron. The red color may be found on bathroom fixtures and laundry. Reddish brown is also an indication of iron which will precipitate when the water is exposed to air. Blue indicates the presence of excess copper. The water may leave green stains on fixtures. Green water can be caused by algae growing in rivers or lakes at certain times of the year. Dark brown or black indicates the presence of manganese and sometimes hydrogen sulfide. There is an arbitrary color scale that is applied to water samples to give a framework for comparison. EPA regulations recommend that potable water should score at less than 15 color units. Anion exchange (usually following a water softener) is a common treatment for tannins, and certain types of macropore carbon are also effective at tannin removal. Iron and manganese coloration are treated in the standard ways that iron and manganese are treated. These can be as simple as a sediment filter for rusty water (oxidized iron) or a full-fledged oxidation/filtration treatment. There are also ozone treatments that are used to remove color from water in swimming pools. Super-chlorination and potassium permanganate are also used for color treatment at times. More about color in water.